A cabana in Ayampe, Manabí Province, Ecuador. 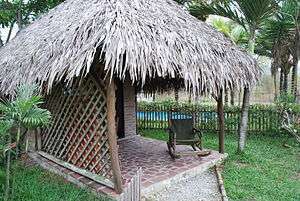 A small hut built with a thatched roof, most commonly built in tropical climates near natural bodies of water. decorative drapes or solid walls; all on one or more sides. These are often at beach clubs, or adjacent to swimming pools at resorts and hotels, and in private gardens. These are often small rooms with ground-level porches that have chairs and tables for relaxation and dining as well as storage for chairs, umbrellas and surfboards or other beach or pool playthings. Urban luxury hotels, such as the Mondrian Hotel and Beverly Hills Hotel in Los Angeles, have semi-permanent ensembles of cabanas on the grounds or on a rooftop terrace that offer outdoor privacy, and can acquire some social cachet. A cabana can be fabricated from a variety of materials and in sizes. Cabana frames can be made of: aluminum or steel with a polyester powder coat paint or other durable finish; treated wood; or composite construction grade plastics. Roofs or top covers, side walls, and curtains can made of exterior grade fabrics, thatched materials, prefabricated panels of lumber, and/or translucent glass-lucite type plastic. More elaborate cabanas can include utilities such as power, communications and entertainment connections, potable water, and/or natural gas. Accessories can include lighting, ceiling fans, outdoor space heaters, entertainment equipment, cold-hot food appliances, and partitions for dressing rooms and minor storage. Furnishings can range from simple patio furniture to more designed outdoor furnishings.